Nigeria remains deeply divided over a ban imposed last month on television stations showing so-called "miracles". Programmes showing miracles have disappeared from screens in compliance with an edict from the Nigeria's National Broadcasting Commission, which took effect from the beginning of May. The NBC, the body which regulates broadcasting, says some of the miracles shown on television are false and stations can broadcast miracles only when they are verifiable. But members of the Christ Embassy, one of the largest churches which used to show healing services, have now gone to court to challenge the NBC. Avid viewer Akangbe Olusola said television schedules were less interesting as a result of the ban. But some Nigerians like Ayodele Ojo say they are glad that television viewers are no longer inundated with church serivces showing miracles. 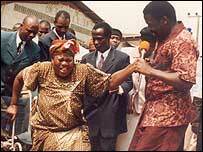 "The truth of the matter was that the airwaves became polluted with miracle programmes," he said. "It got to a point that when you turn on your television set virtually all the stations are showing the same programme." The services showed spectacular scenes of people being healed of ailments that appeared to defy orthodox medicine. In the month since the ban came into force, many television stations are believed to have incurred huge financial losses. "Private television stations thrive on revenue from sponsored religious programmes," said Longe Ayode of the Lagos-based Media Rights Agenda. A sponsored one-hour programme costs as much as $10,000 to broadcast via satellite with some churches sponsoring about 20 hours of programmes a week. The television stations have now replaced the money-spinning programmes with non-commercial music shows and documentaries. The NBC has threatened tough action against any stations that contravenes the ban. Livinus Okpala of the NBC says the commission is fully resolved to enforcing the ban. The sanctions for erring stations include fines, suspension of broadcasting and even the loss of their broadcasting licence, he says. 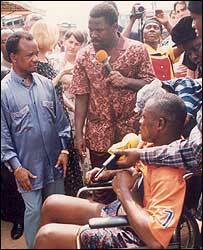 But Temitope Joshua, a "prophet" notable for performing miracles on television, says: "No-one can stop the work of God." 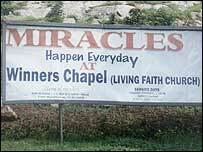 At his Synagogue Church of all Nations, it is business as usual as he performs "miracles". People seeking cures sit together holding placards with bold letters stating the nature of their ailment. Healing sessions, like the ones performed in Joshua's church, normally attract hundreds of thousands of people during special miracle crusades - including celebraties. Frederick Chiluba, attended one such miracle session while he was president of Zambia. Many of these churches also invest a lot of money to advertise on billboards. The billboards compete for space on Nigerian roads with product adverts. Mr Ojo says churches are advertising miracles as a commercial gimmick to attract more members. "These people are not preaching the gospel, they are advertising miracles. It is a marketing strategy to woo more people to their churches knowing that the more people they have, the more money they get." For him church members are like customers from whom those who run the churches make money. Perhaps it for this reason that some Nigerians see churches in the country as business ventures. This has led some to call for churches to start paying taxes.